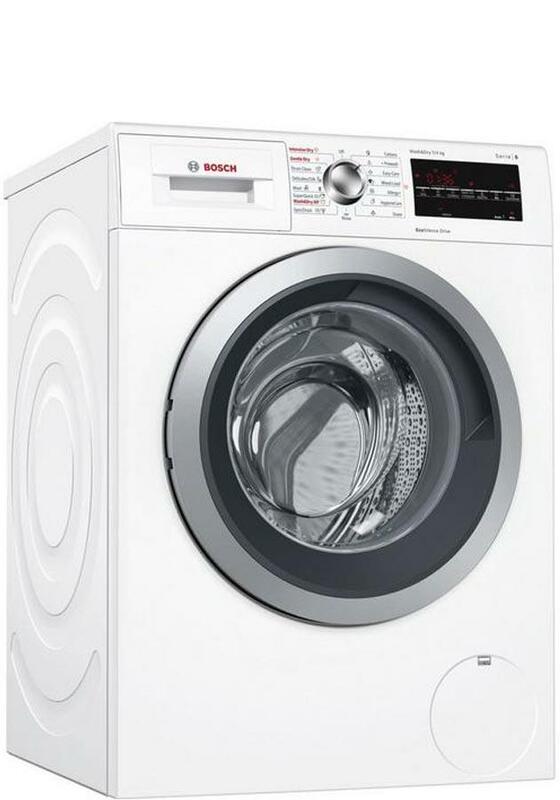 Leaving wet washing in the machine is a thing of the past with the Serie 6 WVG30462GB Washer Dryer from Bosch. Wash and dry your clothes in one handy appliance so you can get on with the more important things in life. With an 8 kg washing and 5 kg drying capacity, the WVG30462GB is large enough to deal with most families’ washing needs. A large porthole and wide opening door make loading the machine easier, while the delay start timer allows you to fit the wash around your schedule. Just load it up, set the timer and get on with your day, knowing the laundry will be finished when you need it. The Reload function allows you to add, or remove, items in the wash once the programme has started. Ideal for that sock you dropped on the way to the washing machine or those clothes you just found under the children’s beds. A child lock is also a helpful addition to ensure curious fingers can’t change any settings or open the door during a cycle. The WVG30461GB has a number of features which provide a superior clean. The 3D AquaSpa wash system uses special paddles and a cascade programme to give a more thorough clean and rinse in less time. Enjoy some peace and quiet thanks to this machine’s built-in EcoSilence Drive. This also makes the WVG30462GB extremely energy efficient. In fact, it has A ratings for both energy efficiency and washing performance. VarioPerfect technology allows you to change the cycle settings to either take 65% less time or use 50% less energy, and there are other features that help save time and resources too. AutoDry ensures the dryer switches off as soon as your clothes are dry, while ActiveWater uses sensors to automatically adjust the amount of water needed for a wash. This washer dryer also features variable spin and temperature options which ensure the best conditions for your wash.
Our installation service covers the whole of Greater Manchester and also many parts of Lancashire. Our prices are constantly monitored to ensure that we are as competitive as national retailers. This Bosch WVG30462GB is also available with a bespoke white glove delivery and installation service.